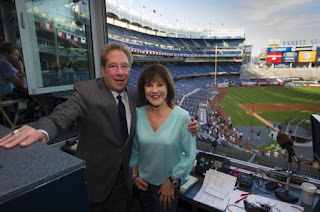 I will be on the Larry Milian radio show each weekend on to squawk about the Yankees. His show airs on WTFL 640 in Florida. I was excited to be his new show's inaugural guest today! Best of wishes to our old Dos Amigos friend in his new radio gig. You can listen to his station by clicking here. One other note - the 500 Home Run Club site is featuring articles on some of the African-American baseball legends who hit 500 or more homers, in honor of Black History Month. There's also a story about honorary 500 Home Run Club member Josh Gibson. And next week, they'll have even more fresh content on some of baseball's biggest legends. Larry Milian, one of Miami's Dos Amigos radio stars, has an all-new weekly radio show, and I'm pleased to be a guest on the first week of the Larry Milian Show. Plus, it's my birthday! Anyhow, if you're in South Florida, tune into WFTL at 640 on your AM dial to hear me on The Larry Milian Show. Everyone else can listen to me live by clicking here, and hitting the middle button on the page for 640. I should be on the show at 12:45 p.m. today, squawking about the Yankees. Check it out! Joel Sherman's column on Mike Piazza sums up how I feel about Piazza in light of the steroid age. Sherman likes Piazza and wants him to be clean. He has no evidence to suggest otherwise. But it's hard not to wonder about a 62nd-round draft pick who sets an all-time record for homers by a catcher. I really hope Piazza is clean, also, and not just because I'm a big fan of his. If something comes out on Piazza, I'm going to have to reevaluate how I look at PED cheats. Because I'm just not ready to stop being a fan of his. It's easy when the big names in the Mitchell Report from your team are people like Mo Vaughn. Seeing Todd Hundley's name was disappointing, but his best years were not memorable ones for the team as well. Lenny Dykstra will always be a major figure in Met history, but by all accounts he did not start to bulk up until well after the 1986 season. He did hit 19 of his career 81 homers during a pennant-winning year, but that was in 1993 for the Phillies. It's fun to sit back on this side of things and watch the parade of Yankee apologies, but it's hard to imagine that no Met stars were (or are) ever involved. If only MLB would try full disclosure for a change. Release the other 103 names, but also emphasize that these were just the guys who got caught and that the problem was much more widespread. Estimate a number - 50%? 80% of players were juiced? Until then, many fans will go for 100%, not just because it's as likely as any other, but because then it won't hurt as bad when it's one of your favorite players who has to make the apologies. Are you getting ready for your baseball fantasy league season? You should check out Heater Magazine, the newsletter that not only features uncommon stats for uncommon players, but it also features Squawker Jon and myself talking about the Yankees and Mets. The mag has a ton of other cool stuff for seamheads as well. And while there is a cost to subscribe to Heater, we have a special offer for Squawker readers. You can get $5 off a Heater magazine subscription by clicking either here, if you're a Yankee fan, or here, if you're a Met fan or Yankee hater. Check it out! Is $20+ for standing-room tickets a reasonable amount? While Squawker Jon is able to write about Mets baseball games, there's a whole lot of controversy going on in Yankeeland that has little to do with the spring training action. I squawked last year about how there were going to be new stadium seats in the bleachers with obstructed views due to the sports bar in center field. Yankee ownership thought it was enough to put in TVs so people could see the action, instead of rectifying the sight view. And then they had the nerve to charge $12 for these seats! "We had a choice of selling it to somebody or not," Trost said. Some views are obstructed "a little bit, but for $12, it's a choice of taking it or not." Who's advising Trost on PR, A-Rod? Sheesh. "Those seats are being sold at $5, not $12," he said. "I think some seats may have gone out improperly invoiced. Those are going to be corrected, but those 600 seats are going to be $5." But while Francesa did get this concession out of Trost, albeit with no explanation or admission of wrongdoing, he left unchallenged something even more ridiculous - Trost's announcement that the new stadium will offer 1000+ standing-room-only tickets per game in the $20 price range. My brother always points out that these days, with big-screen HDTVs being more and more affordable, that you now can see the game much better at home, than in the ballpark. And at least you have a seat there! I've never liked the bleacher seats myself - I detest seats without backs, there's no protection from the sun during day games, and they were cut off from the rest of the stadium in the old ballpark - but the bleachers are a comparative bargain to spending over $20 just for the privilege of standing in the stadium. Good grief. Good news, Steve. While Trost danced around the fact that these foul pole seats are bad - and expensive - he did say on WFAN that the peons - err, fans - who ponied up for the standing-room-only non-seats would still be able to spend money - I mean, get access - to all parts of the ballpark, like the Hard Rock Cafe, the martini bar, and the steakhouse. Well, that's a relief! Trost also explained about how so many fewer seats are available in the new stadium. But whose fault is that, exactly? It's ownership's fault, for deliberately making a new ballpark with many fewer available seats. And for counting standing-room-only seats as part of the stadium's new capacity, which means that there really are 1,000 less seats than previously announced. And appealing to the rich isn't exactly working - for all their marketing efforts, the stadium still has seven unsold luxury suites, and over 1,000 of those premium seats (those tickets ranging from $350 to $2500) unsold. But don't expect the prices to go down. Trost told Neil Best this week that "our prices are our prices." Nice! This is one of the reasons I miss George Steinbrenner. Because, for all his faults, he at least tried to think about the average fan every once in the while. I don't get that same sense from the team's front office now. And that's a shame. Neil Best has been the, well, best at exposing these outrages - he's lived up to the Watchdog title of his blog. Which makes it even more of a shame that Newsday, his paper, is now planning on charging for access to its website. Let's see - take a web site that has been extraordinarily successful, and hit up those readers who made it a success with exorbitant money demands during a recession. Sounds like the Yankees! I have been hearing horror stories about the Yankees' season ticket process. If you have a story of your own to share, please post it as a comment, or email it to me at subwaysquawkers@gmail.com. Thanks. I've watched or taped several live baseball events recently, but today was the first one in some time that did not involve apologies or cousins. There was an honest-to-goodness game on! And the Mets beat the Marlins, 9-0. Didn't make up for how they played against the Marlins at the end of last season, but it was great to see the Mets out on the field again, at the dawn of a new season filled with hope. "I love the energy that Jose Reyes brings, but I don't always like the anxiety that comes with it. I want to calm that down. He needs to play at jazz time. And he's playing at a hip-hop level. I want him to the best jazz player he can be." Comparing Reyes to jazz is almost as odd as batting him third. Does this mean his at-bat music will now be "Take Five" by Dave Brubeck? Instead of singing "Jose, Jose, Jose," will Met fans instead perform jazz hands? Then again, Reyes did hit two homers and drive in six while batting third today. That's something to get jazzed about. True, it's only the second day of spring training, and Reyes was hitting in his usual spot after the pitcher, since Manuel batted Oliver Perez second to make sure he would get a time at bat. And Johan Santana has been scratched from his next start due to elbow soreness. But there was a ballgame on today. Baseball is back! I wrote Tuesday about Joe Girardi taking the Yankees out to play pool. He nixed the idea of taking the team bowling, as he was worried about the pitchers' arms. And it got me to wondering if Girardi passed on any other group outing ideas for the team. So I wrote a piece for the Perpetual Post site with some of the bonding expeditions I figured Girardi passed on. Click here to read my article. Some entries are prohibited due to guidelines for past and present player names. Sure, Torre is no longer on the Yankees and is now affiliated with another team, but so is Bobby Abreu, whose Yankee 53 continues to be part of the pulldown menu. Same with Darrell Rasner, who is now pitching with Japan. And Mike Mussina, who has retired. But no Torre and, goodness gracious, no Roger Clemens 22 either. And if you want a Sheffield 11 or Giambi 25, you'll have to look on eBay. Barry Bonds never played for the Yankees, but you can't get a Bonds 25 either. These names do seem to be available as long as you pick a different number. So Met fans can still get a jersey that says Ramirez as long as they don't pick 24. But the Mets' personalized jersey site does let you pick Hudson 1, for those of us who would have liked to have seen Orlando Hudson in a Met uniform. Alas, we'll have three more years of being able to buy Castillo 1. As Squawker Lisa pointed out, you can't get a Met or Yankee jersey that says STEROIDS or STEROID. Both the Mets and Yankees don't seem to have a problem with ex-New York players in other sports, no matter how they left the team. If you are so inclined, you can get a FAVRE 4 or MARBURY 3 on either site. The Yankee site doesn't ban all controversial former players and managers. You can still get WELLS 33. And the Mets site allows one name that probably should be banned. Yes, it will be possible to show up at Citi Field wearing a jersey that says MADOFF. Trouble, oh we got trouble/Right here in River City! /With a capital "T"/That rhymes with "P"/And that stands for Pool! Heh! Anyhow, I always love seeing the Yankees in "civilian" clothes (click here to see a gallery of pictures from the pool tournament.) Seeing such pix also keeps me up on the recent fashion trends - I wouldn't know who or what Ed Hardy is if it weren't for A-Rod wearing those t-shirts all the time. Your current entry cannot be processed. Some entries are prohibited due to guidelines for past and present player names. Please create a new entry. Your current entry cannot be processed. Language deemed inappropriate, derogatory, or profane will not be accepted. Please create a new entry. Great choice! To purchase your customized jersey, click on "ADD TO CART." 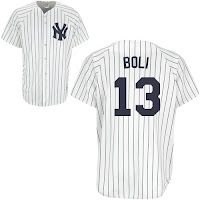 It's $99 to make up an A-Rod "Boli" or "HGH" jersey with No. 13 - too rich for my blood. But I'm wondering if some prankster will do so this year, and what will happen if they try to go to the Stadium wearing such a shirt. Will hilarity ensue? Come to think of it, though - who would want to put a last name at all on a Yankee jersey, given that the players don't have their names that way on their uniforms? It makes no sense. And what's up with the Mets inaugural season jersey being $249? Is it because of that lovely Domino's pizza patch? In addition to this, the Mets site also has not one but two different Mets jerseys for pets, and even a Mets K9 varsity jacket! Talk about a team that's gone to the dogs! One other note - Squawker friend Bob Ekstrom has a whole mess of links about what's happening in Red Sox Nation these days. Click here to see it. Will Mets spend in midseason? The Mets couldn't afford Bobby Abreu or Orlando Hudson at a big discount. So what's the guarantee that they will trade for a full-price outfielder during the season? it will not be very deep into the season that you are going to hear the Mets linked to some expensive right field option from a team looking to dump salary in a bad economy. My early-line favorites are: Detroit's Magglio Ordonez, the White Sox's Jermaine Dye and Kansas City's Jose Guillen. As Sherman points out, these are not cheap options. Magglio Ordonez makes $15 million. Trading for him at midseason would cost almost as much as it would have to have signed Abreu for the whole year. And Abreu would have been for just one year. Ordonez has options for the next two years at $15 million a year. These options become guaranteed if Ordonez starts 135 games or has 540 plate appearances in the previous season, or double those amounts over the previous two seasons. Ordonez just turned 35. In this economy, is there any scenario in which the Mets would be wise to give him an additional $30 million for 2010 and 2011? Jermaine Dye is also 35 (he and Ordonez coincidentally were born on the same day - January 28, 1974). Dye will make $11.5 million this season. He and the White Sox have a mutual option for next year with a $1 million buyout. So Dye would come cheaper than Ordonez, but a midseason acquisition would still cost almost $6 million. And while the Tigers might be willing to dump Ordonez because of the prohibitive salary, the White Sox will want some good prospects in return for Dye. Yes, Abreu is lefthanded and the Mets could use a righty hitter, but a full season of Abreu for $8 million would have made a lot more sense than half a season of Dye for almost $6 million, plus prospects the Mets can't really spare from their thin farm system. As for Jose Guillen, he's entering the second year of a three-year, $36 million contract. Trading for him at midseason would leave the Mets on the hook for $18 million. The ongoing José Guillen Chronicles added two new installments Saturday at the Royals’ camp — a link to a controversial Dominican trainer and yet another ailment. Two days ago, Guillen performed self-surgery in removing an ingrown toenail. Saturday saw him nursing a sore right shoulder before confirming he has worked with Angel Presinal but denying those workouts ever included performance-enhancing drugs. I just hope that toenail surgery isn't on YouTube! I don't want Guillen on the Mets at a discount, much less with his contract. But none of these guys will come at a discount, which is why something will have to change if any of them are to end up on the Mets. And the way the economy is going, and the way Citibank is going, any changes could very well be for the worse. And how will the Mets explain making a $20 or $30 million commitment to one of these players at midseason when they won't make a similar offer to Manny Ramirez? What if these Yankees or Mets were in the White House? Last month, Squawker Jon and I were featured on Yahoo Sports' Big League Stew - we wrote on what it would be like if certain Yankees or Mets were elected president. Click here to read our original piece. Anyhow, we asked readers to come up with their own jokes, and we got some funny responses. Here are a few of them. President Jeter would have a new First lady every week. President Strawberry and VP Gooden would be taking Air Force One on "Goodwill" missions to the Colombian jungles and returning with special care packages all of exactly 1 Kilo. President Vince Coleman would sneak up on our enemies and throw cherry bombs and giggle like a school girl. President Beltran would end the War in Iraq, reduce the national debt, and hit 8 home runs in the months leading up to his election. Then chill for like a year without really doing anything after he's elected and then realize about 18 months in that he has to start accomplishing some things otherwise he won't be able to cash in on the lecture circuit when his term is up. President DiMaggio would see how many consecutive bills he could safely sign without Congress voting them down. if manny ramirez were president he would take a leak behind the curtain during the State of the Union address. Do you have any jokes to add? Leave us a comment! The best story of the winter was the plane landing on the Hudson. But what could turn out to be the worst story of the winter for the Mets is the failure to land Hudson. The Dodgers signed Orlando Hudson for only about $3.5 million, plus incentives that could bring the deal up to around $8 million. The Mets signed Freddy Garcia for $1.5 million if he makes the 40-man roster, plus incentives that could bring the deal up to $8 million. The Mets signed Alex Cora for $2 million. Maybe Garcia will turn out to be a great signing and Cora will be able to fill in if and when Luis Castillo comes out of the lineup. But as of now, for similar financial risk, I think the Mets would be better off with Hudson than with Garcia and Cora. The big question here is where the Mets were in all of this. They have an expensive sieve -- no, black hole -- at second base in Luis Castillo, and Hudson would be an easy upgrade of almost two wins. Based on the last two years, two wins could be the different between making the playoffs and staying home. Then again, if instead of replacing Luis Castillo in the lineup, he gets moved up to leadoff, the Mets this year might get eliminated before the final day of the season. Being a Yankee fan can sometimes resemble being in a marriage. There are great moments as well as infuriating ones. But did you ever want to divorce the Yankees? Jane Heller did, and she writes about it in her new book, "Confessions of a She-Fan: The Course of True Love With the New York Yankees." It is this particular game that unravels me. In the fourth inning, I explode in frustration - I want to rip the plasma screen off the wall. I start flinging objects everywhere - the TV remote, a copy of Newsweek, a hunk of Gorgonzola from my Cobb salad. The cheese lands in [husband] Michael's beard and nests there. "What's the matter with you!" he shouts. You're being a complete *******!" I am being an *******. But I feel betrayed by these 2007 Yankees. I remember I wrote a few angry Squawker blog entries after that game. Jane did some writing of her own as well, but it turned out to be on a much bigger scale. She was so ticked off after the game that she decided to write an essay about how she was divorcing the Yanks on the grounds of mental cruelty. Just for the heck of it, she sent the piece to Harvey Araton of the New York Times. He ended up passing it on to NYTimes sports editor Tom Jolly, who ran the article, entitled To Love and to Cherish for All Eternity, in the Sunday Times' sports section. The piece caused a huge stir - it was the Times' most emailed and discussed story for that week. While some people loved the article, other fans, including this one, were peeved over it. Divorce the Yankees? Never! I remember griping to Squawker Jon at the time about that piece because I was outraged over the very idea of divorcing the Yanks. Heller, who was perceived as a bandwagon fan thanks to the article, was stung by the negative reaction. She wanted to "prove to [her] detractors" that she is "a true fan." So she ends up following the team around for the last two months of the regular season. The stories of what Jane - and her patient husband, who is along for the road trips - see at the games provide most of the narrative of "Confessions." Jane also talks with a bunch of the people around the Yanks - announcers, beat reporters, and columnist - and she promises her book publisher she'll get to interview a Yankee to give her book a player's insight. You'll have to read the book to see if she gets to talk to a Yankee, but Heller does succeed in proving her fan credentials. "Confessions of a She-Fan" is passionate, funny, smart, and sassy. It's not just an accurate depiction of the highlights (A-Rod's 500th homer and lowlights (the bug game!) of the 2007 season, but it's a great look at what it is like to be a fan. While the book is from a female Yankee fan's perspective, the observations will hit home, whether you're male or female, and whether you're a Yankee fan, Met fan, or (shudder!) a Red Sox fan. Heller hits a homer with her first non-fiction effort. Full disclosure - Heller had already won me over this winter with her Confessions of a She-Fan blog, and after I wrote her saying so, we've been corresponding ever since, and she's been posting here on the Squawkers as She-Fan. While we haven't "met" in person yet, I have read several of her novels since talking to her online - her fiction books are smart screwball comedic reads - and think she's got a great personality. And that personality comes through in "Confessions of a She-Fan." You can read an excerpt of Jane Heller's "Confessions of a She-Fan" here, and purchase it here. Click here to read Heller's Yankee blog. The last piece of Shea Stadium came down Thursday, and people at the site cheered. Metsblog posted video of the sad event. At least I thought it was sad - when the video was shown on Mets Hot Stove report, there was also cheering. Poor Shea never got any respect. It couldn't even go out on a high note - our last memories are of yet another collapse, followed by what should have been a celebration of the stadium's history but ended up being more of a funeral. A google search shows that others have made the same comparison. Good to know there are a lot of Shea fans still out there! Squawker Lisa, you'll probably give me grief for comparing Shea to paradise, but in good seasons and bad, there was nothing quite like walking through the entryway from the concourse and seeing the big field stretched out in front of you. Taking your seat surrounded by Met fans and Met memories. So I'll hold off on cheering until I'm in the new ballpark, starting on some new memories. Will you miss Shea? Tell us what you think. Derek Jeter is finally disappointed with the Steroid Era? What took him so long? "Our job is to try to support him as he tries to get back on the field and get ready for the season," Jeter said today in his annual spring-training sitdown with the media. "But he made a mistake, and that's the bottom line. ... He came out and admitted what he did and now it's time to move on." "Even when you have family members that make mistakes and do things wrong, you may be disappointed, but you don't lose respect for them and stop pulling for them." So far, so good - it's comparable to what he did with teammates Jason Giambi, Gary Sheffield and Andy Pettitte with their controversies regarding performance-enhancing drugs. It's what he should say as the team captain to support his teammate. "One thing that's very irritating and upsets me a lot is when you hear everybody say, 'Well, it's the Steroid Era, everybody's doing it. Well, that's not true. Everybody's making a big deal about the list, 104 players. How many players are in the major leagues? 1,200 players? So everybody wasn't doing it." I agree that not everybody was doing steroids, but this quote is a bit much, given that all the players were given a heads-up in 2003 about this steroids test, but 104 players still failed it. Contrary to what Jeter is implying, that doesn't mean only 104 players were using. I asked Jeter yesterday if in retrospect, he had any regrets about not going to the players association, or even the media, with his concerns about drug abuse ruining the game he loves, and more importantly, staining the reputations of its clean players simply by association with the Other Guys. "In retrospect, I think a lot of people would've maybe tried to do some things differently," he said. "But you can't go back eight, 10 years and change what's already been done." Eight years? Why not go back four months, to when Jeter was seen on national TV hanging out with reported steroid user Roger Clemens on the sidelines of a University of Texas football game and posing for pictures together? I mean, really. Texas Monthly had Clemens as their Bum Steer of the Year, and a Houston hospital removed the Rocket's name from their Sports Medicine wing. And Jeter's still publicly schmoozing with this pariah? I guess some might see it as admirable for Jeter to be a loyal friend to Roger, but at the time, Derek shouldn't complain about being linked to the Steroid Era when he continues to buddy it up with one of the era's poster boys, especially when they're not even teammates anymore. "Seems like now people are rushing to judgment and I think you have to let it play out a little bit before you make your decision on whether he's guilty or not," Jeter said. Asked if he stands by Clemens, Jeter said "Yeah. Rocket's always been a great teammate. I've said that time in and time out, that he's a great teammate. I didn't like him too much when I played against him because he has always been very competitive. But he's always been a great teammate." "The thing is because there's all these (steroid) accusations, and no one knows, so unless you have proof, then stop accusing him. I mean, he's done some great things in the game, he's about to pass Babe Ruth with all-time home runs and, you know, it's putting baseball in a bad light because they keep talking about it." This was after BALCO, and after "Game of Shadows" was released. How much more proof did Jeter need? Not to mention that he essentially claims then that the problem wasn't players doing steroids, but the media talking about it! “What’s that going to do,” he asked. “It’s just going to be another story and another black eye for the sport. I don’t think people should go around and ask everybody if they’re on that list, because it’s supposed to be anonymous....There were a few people in this era taking steroids, but it wasn’t the steroid era,” he said. If Derek really believes that it was just "a few people in this era taking steroids," then denial isn't just a river in Egypt! One programming note - forgive me for not squawking yesterday during a big Yankee news day. I was getting surgery for a recent medical issue, and I'm now on the 15-day disabled list, so to speak. But fortunately, after a few pitches on flat ground, I'm up to squawking a little. "Our problem right now is we have too many pitchers on the 15-day Pavano. That's what it's officially called now. Did you know that? The Pavano. "His body just shut down from actually pitching for six weeks. It's like when you get an organ transplant and your body rejects it. His body rejected pitching. It's not used to it." Coming later today - my review of "Confessions of a She-Fan." But in the meantime, what do you think about Derek Jeter? Leave us a comment! When A-Rod said at the beginning of the presser that he was a little nervous, he did that whole puffing up his cheeks and pursing his lips thing he does during stressful at-bats. And when Alex read - or should I say droned - his written statement, I was thinking of Cheech and Chong's "Sister Mary Elephant" comedy routine, when Chong reads his summer vacation report in a monotone. Come to think of it, maybe Alex should have read something about what he did on his summer vacation instead. I knew all about the mystery cousin thing before viewing the press conference (Is it Cousin Itt? Cousin Vinny? Who knows? ), so I busted out laughing hearing A-Rod explain it. This is what the best and brightest PR team came up with as his defense? Sheesh. And this is the thing I can never get past regarding steroid usage - the whole needle thing. I have rolling veins, so every time I get blood drawn, it's torture. And I don't really like needles anyway. So I just can't understand how ballplayers could let some buddy or trainer or "cousin" stick a needle in them. Bad things happen when you let somebody shoot you up. Didn't he see "Trainspotting"? What was up with the very long pause when A-Rod started talking about his teammates? Was he overcome with emotion or calculated? It was very strange. And it was also odd that he recommended that if he had a son, he would recommend that he go to college. Alex has two daughters. Does he not think they should go to school beyond high school? The whole "I didn't go to college" excuse doesn't really fly, either. Nor does the young and stupid one. Roger Clemens went to college (my alma mater, incidentally) plus he was accused of juicing up in his 40s. My brother pointed out that A-Rod had his "cousin" smuggling drugs from the Dominican Republic for him. So didn't he put his family member in legal jeopardy? Wonder what GNC thinks of Alex keeping on bringing them up as selling steroid-type products? The thing that rang the most true to me, where Alex sounded the most sincere, was when he said that the effects of performance-enhancing drugs were half-physical, and half-mental. Other than that, this press conference was pretty much a disaster. But, as A-Rod said, he laid his bed, and now he's going to have to sit on it! What do you think? And which cousin helped A-Rod? Leave us a comment! What, you thought A-Rod would give up the spotlight that quickly? Once again, a media appearance designed to answer all questions only raised more of them. We met a new character in the A-Rod soap opera - the cousin A-Rod says got him the steroids and injected him. Actually, we didn't quite meet him - didn't even get his name - but what's a good soap opera if answered questions don't lead to more questions? Even if A-Rod had named the cousin, the story was still full of holes, several of which were caught by questioners in the news conference. A-Rod didn't think he was doing anything wrong, yet he still kept it carefully hidden. A-Rod didn't know if it helped him at all, but in his opening statement said he used the substance about twice a month over a three-year period. I might have found the story more credible had A-Rod admitted that he varied the dose - once a month, once a week, etc., since he was supposedly experimenting. But then he would have had to admit that he thought it did some good. And maybe then he could have admitted that he was cheating. But according to A-Rod today, he didn't think he was cheating and didn't think he was doing anything that helped his performance. Many baseball players have superstitions. Wade Boggs ate chicken every day because he thought it helped him hit. Boggs probably couldn't explain why chicken helped him hit any more than Oliver Perez could explain why jumping over the foul line helps his pitching. But because it's clearly a superstition, the public accepts it. We don't demand to know why it's chicken and not pork. Or why it's every day and not twice a day or once a week. But unless A-Rod wants to come up with a story about a lucky syringe, he's going to finally have to admit that he was taking steroids because he thought they would help his performance. A-Rod mentioning that he had taken a blood test in 2006 for the WBC and would be taking one again in 2009 should have scored points. But by not saying yes when asked if he were willing to be tested more than other players, he raises questions as to what happens in the years he doesn't take a blood test. Maybe it's a coincidence, but 2006 turned out to be a down year for A-Rod, while '05 and '07 were MVP years. For all of his new advisors and PR people, A-Rod stuck to many of the same points that didn't work all that well in the interview with Peter Gammons. Once again, A-Rod pointed out that he was young and naive. This time, A-Rod also kept mentioning that he had not been to college. If going to college automatically makes you more mature and less likely to use illegal substances, that would be great news for the NFL, where just about every player in the NFL has spent multiple years in college. But that hasn't prevented a steady stream of pro football players from running into problems. In terms of maturing, surely six years of major league experience must count for something. I only caught this when I listened to parts of the interview a second time, but it sounded as if A-Rod ultimately refused to clarify his answer of "pretty accurate" when Gammons asked him if he used PEDs from 2001 to 2003. A-Rod said today,"When it started, it was probably in the middle of '01. When it ended, it was '03." A-Rod says "probably" so quickly that it comes out as "prolly." And maybe others will interpret this differently. But it sounded to me as if A-Rod left another loophole in his story. Finally, this is a small point, but when A-Rod talked about facing the media to address what he had done, did he have to say "I'm here to take my medicine"? He said this not once, but twice. Or maybe that's part of the problem - A-Rod may have convinced himself that was all he was doing. Saying "I cheated" would have been a bigger headline, but it also would have gone a lot further toward putting this story to rest. Squawker Lisa, I know you wanted to watch the news conference live so you could see what you called the "A-pology," but don't worry, this probably won't be the last one. I have a real-life obligation this afternoon tied to one of those pesky paycheck things, so I will be unable to see the Alex Rodriguez press conference live. Can you believe that? It looks like a cast of thousands will be there, but I will miss it all as it happens. Bummer. However, while I won't get to squawk about it live, Squawker Jon will. And he will be doing just that with 'Duk, David Brown and others in Yahoo Sports' Big League Stew live blog today of the presser. Check out their comments starting at 1:15 p.m. today at the Big League Stew site. Click here to read it. Thanks to Kevin Kaduk for this very cool opportunity. So who will be the next baseball player to get in trouble for steroids? Which slugger will be the next to admit they juiced? Will Alex Rodriguez testify on Capitol Hill? With all the problems in the media these days, from furloughs to cutbacks to layoffs, it's comforting, I guess, to know that people are still interested in reading about at least two public figures - Barack Obama and Alex Rodriguez (three if you count Octomom as a public figure). For the last few months, President Obama has been ubiquitous at the newsstands. This month, it looks like it's going to be all about A-Rod. Not only is he on every tabloid every day, it seems, but now he is featured on the latest issue of the New Yorker. Yes, that highbrow, highfaluting, intellectual magazine, whose most famous cover character is a gentleman in a top hat, has put A-Rod on the cover of this week's issue. Barry Blitt, the cover artist, also drew that infamous cover last summer featuring Barack and Michelle Obama as radicals. The A-Rod's cover isn't nearly as controversial, of course, although I did notice that there is no interlocking NY logo on Alex's uniform. What's that all about? One person who’s spoken with Rodriguez says his handlers have settled on the following damage-control strategy: minimize the apologies, keep Tuesday’s Q and A relatively brief and make sure to not drop any more bombshells. I'd think he'd be better off hosting a "Free Madea" rally, but that's me. Seriously, A-Rod is a guy who has powerhouses like Scott Boras and Guy Oseary advising him. And they finally figured out that when Alex gets in front of a camera, he has a tendency to get off track, talk too much, and make stuff up to make himself look good? Sheesh. The thing is with A-Rod is that he thinks he's media-savvy, but he's really terrible with the press. Like the whole Serena Roberts thing in the Peter Gammons interview. I understand that Rodriguez feels violated that she's writing a book on him, but he could have skipped the whole "the lady from Sports Illustrated is breaking into my house" part of the interview, and been much better off. And he would have had one less thing to apologize for. I don't think the Gammons interview was terrible, but, as Squawker Jon noted, Alex should have talked a lot less - 35 minutes gave him too much time to make trouble for himself. Was it fatal to him? Nah. Andy Pettitte may have been terrific in his spring training apology last year, but it wasn't his first crack at it. He had previously had his agents issue a mealy-mouthed admission when the Mitchell Report came out, that didn't go over as well. So here's what I think Alex should do - watch the Mike and the Mad Dog interview he did in the spring of 2007. (Surely somebody on the YES Network has a copy of it.) It was the best I've ever seen A-Rod. He came across as candid and endearing and appealing. When Mike and the Mad Dog asked him a sticky question - how he felt about Joe Torre batting him eighth in the ALDS - he hit it out of the park. Alex admitted to being upset about it (he said he kept on looking down the lineup expecting to see his name) but ultimately blamed himself for it, because of his lousy play in the playoffs. Being sincere - or at least looking sincere - worked for A-Rod in that interview. He should try to remember how to sound like a real person in tomorrow's presser, instead of Robo-Rod. But if faking sincerity is too much for Alex tomorrow, he could just say "I make $27 million a year. Kiss my asterisk!" What do you think about A-Rod? Leave us a comment! I would love to see Luis Castillo leading off - for 29 other major-league teams. I'd also like to see him leading off for the Mets' Triple-A affiliate in Buffalo. But on the Mets? Not so much. But Jerry Manuel wants to give it a try. Castillo has yet to show he belongs in the lineup, much less in the leadoff spot. Down the stretch last year, Manuel benched him in favor of recent pickup Ramon Martinez, who was about to turn 36. Castillo would have been gone this year except that no team wanted his contract. Castillo vows he will turn it around this year, and he should get that chance - at the bottom of the order. If he actually starts to produce, then move him up to second, but not leadoff. Salvaging whatever is left of Castillo's career is not worth creating potential problems with Jose Reyes. The Mets are blessed with perhaps the best leadoff hitter in baseball. After faltering in the second half of 2007, Reyes got back on track last year and is once again one of the Mets' main strengths. When Reyes was struggling, he kept hitting the ball in the air and popping up, rather than hitting the ball on the ground, where he could use his speed. Now that Reyes has gone back to hitting line drives and grounders, is it a good idea to move him to a spot where he will be expected to hit for more power and could fall back into bad habits? I thought the Mets had learned their lesson with Reyes when they moved him to second base to make room for Kaz Matsui. Even then, while Matsui batted leadoff the first part of 2004 while Reyes was on the disabled list, once Reyes returned, he was in the leadoff spot for good within a week. Reyes shouldn't have to move again - and certainly not for the likes of Castillo. Tell us what you think of Jerry Manuel's proposed lineup experiments. Last year, when the Twins traded Johan Santana to the Mets, they replaced him in the rotation with Livan Hernandez. I never felt more grateful to be a fan of a big-market team instead of a small one. Somehow, the Twins won 88 games last year, only one fewer than the Mets, and made it to a one-game playoff with the White Sox. Alas, Hernandez did not make it through the season - despite winning ten games by the end of July, he was designated for assignment on August 1. Presumably, the Twins were not thrilled with Hernandez' 5.48 ERA. Hernandez was picked up by the Rockies, where he made eight starts and had an ERA of 8.03. That's right, 8.03. Batters hit .345 against him. While Hernandez did have to content with Coors Field as his home park, his batting average against was almost the same with the Twins - .341. In 2007, Hernandez pitched a full season for Arizona, going 11-11 with a 4.93 ERA and .308 batting average against. So for the last two years, Hernandez has been a bad pitcher for three different teams. And this year, he gets a chance to make a fourth team miserable. Hernandez has signed a minor-league deal with the Mets. I thought the Mets were set in the rotation, with Tim Redding in the number 5 spot and Freddy Garcia battling to take that spot for himself. And the Mets have two young pitchers, Jon Niese and Bobby Parnell, in case they need more starters. Hernandez is listed at 33 (turning 34 next week), but talk about numbers that deserve an asterisk. I thought Omar Minaya was starting to get over his habit of signing players who were old, broken-down or both. Now, within a couple of days, he signs 40-year-old Jose Valentin and Hernandez. Let's hope this year doesn't turn into "same old, same old" for the Mets. "On behalf of Major League Baseball, I am saddened by the revelations concerning Alex Rodriguez's use of performance-enhancing substances," Selig said. "While Alex deserves credit for publicly confronting the issue, there is no valid excuse for using such substances and those who use them have shamed the game. "What Alex did was wrong and he will have to live with the damage he has done to his name and reputation." Meanwhile, former MVP Miguel Tejada, who admitted buying human growth hormone, although he claimed he never used it, also made the news recently. He pleaded guilty to making misleading statements to Congressional investigators during the Mitchell Report investigation; Tejada denied knowing that other teammates were using steroids. So it sounds like Tejada got prosecuted for obeying baseball's code. Now is he not only facing possible jail time, but he might even be deported. So what does Bud Selig say about that? Nothing. Shocker. It's convenient for Selig to make this issue all about A-Rod, instead of taking responsibility for his own lack of action on the steroid era. Heck, he couldn't even feign outrage over the allegations that MLB player rep Gene Orza was tipping off players on steroid tests. Not to mention the lack of concern that a confidential test was exposed. Good thing MLB is paying Bud $18 million a year. Sheesh. At least spring training is starting. Hooray! It's scandalous. Everybody is talking about it. Purists are in a tizzy. A-Rod taking steroids? No, Westminster Kennel Club winner Stump the Sussex spaniel snubbing Sardi's restaurant! At least there's no evidence that the 10-year-old dog (70 in human years) won the dog show by using PEDs (Pooch-Enhancing-Drugs)! "It was against the law, so I would have to think about that," Selig said of possible action against Rodriguez. "It's very hard. I've got to think about all that kind of stuff." Let me get this straight. A-Rod needs to get punished - for what, exactly? It took until 2004, over a decade into Selig's tenure, to even get a specific steroids ban in baseball. So what A-Rod took may have been illegal, but it wasn't banned by MLB at the time. Not to mention that the test A-Rod failed was 1) A survey test that was supposed to be destroyed, and 2) Was never supposed to be used to punish individual players. True, baseball's steroid policy was shameful, but Selig had a heck of a lot to do with that. Maybe Bud can retroactively punish himself. Oh, and while Selig may be thinking about suspending A-Rod, he doesn't appear to have given any thought to thinking about finding out the names and punishing the other 103 players who also failed the test. Or finding out why a confidential survey test was leaked to reporters. And as for that illegality issue, Joba Chamberlain has been accused of driving drunk, but I guess I missed any worries of him being suspended from baseball if he is convicted. So I'm just wondering - has Selig ever been on the right side of anything? He has been MLB Commissioner since 1992, and was in charge of the game during virtually the entire Steroid Era. He looked the other way when players were puffed up to the size of bodybuilders. He didn't do anything to Barry Bonds, Mark McGwire, Sammy Sosa, Jason Giambi, Andy Pettitte, or Roger Clemens. He didn't really push for banning steroids until over a decade into his tenure. But now he's thinking about suspending A-Rod - for what, exactly? For being the only one of the 104 positive tests to be exposed? For actually telling the truth a little? Unreal. You know, we all complained about PED-using players not admitting to much of anything. Barry Bonds and Roger Clemens are all about denial. Mark McGwire didn't want to talk about the past. Jason Giambi apologizing for taking "stuff", but wouldn't say what the "stuff" was. And now here's Alex Rodriguez, who not only admitted to what he was accused of, but who tried to explain about the clubhouse culture at the time. Was he telling the truth, the whole truth, and nothing but the truth? No. But he did tell more than anybody short of Jose Canseco. Making an example of A-Rod here will make him a martyr. Is that what Selig wants? If MLB does dole out some sort of punishment to Alex, don't expect any player to ever confess to anything on this steroid issue ever again. Thanks for nothing, Bud. Should Mets have signed Bobby Abreu? Jon Heyman of SI reports that Bobby Abreu has signed with the Angels for $5 million, plus incentives. Seems like a real bargain for a player who batted third in the Yankees' powerful lineup and hit .296 with 20 homers and 100 RBI last year. And, since the Yankees did not offer him arbitration, Abreu won't even cost the Angels a draft pick. It's one thing to balk at paying Manny Ramirez money. But the Mets will lose more money than they are saving by not signing Abreu if they miss the playoffs as a result. Can Ryan Church play like he did at the start of last season? Can Daniel Murphy continue to build on his impressive debut? If so, the Mets will be better off not signing another left-handed outfielder. There are a couple of other reasons it might be good not to have Abreu on the team. The Yankees made no effort to keep him even though he was still productive. Do they know something? The market for Abreu did turn out to be remarkably bad. If the Mets had signed Abreu, it would have meant signing a Yankee castoff. And speaking of the Phillies, they were also quite happy to get rid of Abreu, getting almost nothing in return when they sent him to the Yankees in the middle of 2006. And in the following two seasons, the Phillies made the playoffs both times and won the World Series. Meanwhile, with Abreu on the team, the Yankees saw their postseason streak end in 2008. Could Abreu be a "cooler," as A-Rod has been accused of being? So far, the worst thing anyone has said about Abreu is that he doesn't like to go near the wall. But after what happened to Ryan Church last year, Met fans might reasonably hope that the team's current right fielder avoids the wall and steers clear of potential collisions that could trigger another concussion. The Mets badly needed K-Rod and a starter like Oliver Perez. They were not cheap when they had to fill these positions (unless you feel that they should have spent $24 million more to get Derek Lowe). But the need for another left-handed outfielder was not as great, even if it's likely that Abreu has a better year than Church or Murphy. If the Mets had a certain amount money to spend as they claim, they spent it in the right places. And the way these signings of players in their mid-thirties often work out for the Mets, Abreu could get hurt or suddenly lose his skills. Look at what happened to Roberto Alomar (who is in the news today for much more troubling reasons). Imagine how Met fans would turn on Abreu if he could not replicate his star performances with the Mets' biggest rivals - the Yankees and Phillies. So passing on Abreu does not seem so bad as of now. But the pressure on Church and Murphy just went up. Once his price went down, should the Mets have signed Bobby Abreu? Tell us what you think. This morning, I checked out what the Boston papers had to say this morning about the Alex Rodriguez steroid scandal. Not-so-shockingly, it has been a huge topic in Beantown, along with Tom Brady apparently being so, um, tamed by Gisele Bundchen that he let her feed him in public. Yikes! That twosome was also spotted wearing matching outfits. You see, Squawker Jon, if Tom Brady would agree to it, why won't you for our Squawker blog photo? Of course, Tom and Gisele are wearing black shirts and blue jeans, and I want us to wear matching Snuggies, but still! “It’s an unfortunate thing to hear that,” Youkilis said. “It’s also a good thing that he came out and admitted it. Sometimes it’s hard to go out there and admit to something in your past. There’s a lot of people in this world who have done something wrong. Myself, I’ve done things wrong, not in that nature. “I don’t know if someone had it in for him,” Youkilis said. “It seems like just to take one name out of that group is a little odd. The whole thing is kind of unfortunate. Some of the players were betrayed (when the confidential results were leaked). Those weren't the only sympathetic comments in Beantown. Dan Shaughnessy of the Boston Globe called out the New York tabloids for being too harsh on A-Rod. So much hate. So little time. Sorry, I just can't get into hating the guy that much. We ripped into Bonds and Clemens for denying the obvious and treating us like stooges, now we tear into Rodriguez for admitting his guilt and saying he's sorry? Red Sox fans, gleeful over this A-Rod scandal, need to remember that there are 103 other players who tested positive in 2003. Someday, those names could be released. There's a pretty good chance that one or two of the Sox stars from 2003 will be on it. What do you say about A-Rod when that happens? ...we cannot help but wonder why certain sources selected Rodriguez's name from a list of 104 and streamlined it to the nation when 103 others effectively were ignored. Why, because Rodriguez is generally better than everyone else? Because he has the most to lose? Because he is an easy target? Because neither he nor anyone else has proven capable of defending him? It is a bit funny that I've read more sympathetic comments about A-Rod in the Boston media, than in the New York media. I don't quite know what to make of it yet! But what do you think? Leave us a comment. * My standard of whether an athlete is kind of a big deal is when my mother has heard of him. A-Rod is such a big deal that President Obama talked about him in a press conference! Now that's famous. * Nice choice on Peter Gammons to do the interview. Peter, who was literally in the running to be president of Red Sox Nation last year, has slammed Alex hard in the past for, among other things, opting out during the World Series. It makes A-Rod look like he was willing to do a tough interview, even if Gammons wasn't exactly fierce with the followups. * I notice that the interview background looks all homey, with the flowers and the piano. A-Rod was trying for a cozy look with the sweater. He should have worn a Snuggie. * Speaking of which, I give a thumbs-up to my new Snuggie. As a matter of fact, I am squawking while Snuggie-ing! What, do you think I could get my hands out of one of those complicated blankets in order to type? Please. * What was the phrase back in Watergate? The modified limited hangout? That's what A-Rod's confession was. He volunteered more details than we would have expected, and more than any steroid user other than Jose Canseco did, but he still left a lot out. Shocker. * The timeframe that A-Rod claimed to have take steroids is a bit self-serving - it doesn't cover the Yankee years, of course, or the Seattle numbers he rang up in order to get that $252 million contract. He did pass all steroid tests since 2003, but why? * Nor do I believe that a control freak like Alex, who literally plans out his meals days in advance, didn't know exactly what performance-enhancing drugs he was putting into his body. C'mon, now. What is he going to say next - that he didn't know that the hairdresser was coloring his hair when he went for a haircut? * And was he really suggesting that Texas being a hundred degrees a day caused him to take steroids? Drinking frozen margaritas, maybe, but steroids? Maybe all that heat did something to his brain. * A-Rod really, really doesn't like Selena Roberts, or as he calls her, "the lady from Sports Illustrated." I guess her writing that he was a slumlord last year didn't exactly endear herself to him! * Can somebody please tell A-Rod that the phrase is "couldn't care less," not "could care less." He's been getting it wrong for years now. Thank you. * And, as Squawker Jon pointed out to me on the phone last night, if A-Rod wants to show how clean he played for most of his years, he probably shouldn't keep on talking about finishing second in the MVP race to Juan Gonzalez. Just sayin'. * On another note, I'm feeling bad for author (and friend of the Squawkers) Jane Heller. First Joe Torre's "The Yankee Years" was released the same day as "Confessions of a She-Fan," her non-fiction book about her love of the Yanks. Then she had a nifty New York Times piece about seeing a tarot card expert to predict the 2009 season, only to have the article come out the same weekend as the A-Rod steroid report. Not to mention that I still haven't written my rave review of her book, thanks to my squawking time being consumed by first Torre, and now A-Rod. Sorry, Jane. To use an A-Rodism, I was too loosey-goosey on my writing schedule. I blame the Squawker culture. I'll bet Alex Rodriguez misses the days when the worst thing said about him was Steve Phillips claiming A-Rod wanted so much special treatment it would create a 24-and-one culture on whatever team he signed with after 2000. Now A-Rod finds himself getting special treatment of a very different kind - the only one of 104 players who tested positive for steroids in 2003 to be outed. I think A-Rod is being singled out. And I give him credit for admitting guilt and apologizing directly and without conditions. But after watching the whole interview with Peter Gammons, I just don't find a lot of it to be credible. As I wrote earlier, I find it hard to believe that A-Rod felt under so much pressure to perform when he went to Texas that he started using steroids, but did not feel the same pressure when he went to the slightly larger media market of New York. When you admit to taking steroids because you felt under pressure to live up to expectations, it calls into question future situations. In 2004, A-Rod's new team choked in the playoffs, losing to the arch-rival team he nearly signed with. A-Rod was blamed for not hitting in the clutch and attacked for the "slap" play. Presumably, A-Rod felt under great pressure to succeed the following year - and responded with an MVP season. Coincidence? Who knows. By the end of the 2006 season, A-Rod was again under attack for playoff failures, even being moved to the eighth spot in the batting order by his manager. Presumably, A-Rod felt under great pressure to succeed the following year - and again responded with an MVP season. Coincidence? Who knows. It's possible that, with the advent of testing, A-Rod did stop his use of PEDs when he came to the Yankees. But, as I wrote before, when Gammons asked if his period of use was 2001, 2002 and 2003, why did A-Rod say that was "pretty accurate"? Actually, it would probably be worse for A-Rod if it turned out he was using steroids before Texas, when he played with Seattle, than if he used them with the Yankees. Steroid use in Seattle would place his whole career in question. At least Barry Bonds and Roger Clemens built up superstar credentials before the steroid era. A-Rod's claim that he did not start taking steroids until he arrived in "loosey-goosey" Texas is believable, even if I'm not sure if I believe it. But his claim that he did not know what he was taking remains harder to accept. In the full interview, it became even more sketchy, with A-Rod muddying the issue with statements like: "back then you could walk in GNC and get four or five different products that today would probably trigger a positive test" when the substances A-Rod tested positive for were not the sort of things one could get at GNC. At the time, Peter, I wasn't even being truthful with myself. How am I going to be truthful with Katie or CBS? Today, I'm here to tell the truth, and I feel good about that. I've read the first two sentences several times and am still not sure exactly what he means. Is A-Rod saying he was in denial during the Couric interview? Or that he wasn't there to tell the truth at that time? Gammons: So from 2004 on, you have been completely clean? So Gammons asks a question along the lines of what Couric was asking, and A-Rod responds in exactly the same way as he did during the Couric interview. Last time, most people were inclined to take A-Rod at his word. But once you've lied on national TV, it's hard to know what to believe. Overall, I do think A-Rod deserves credit for a forthright, no-strings-attached admission of guilt that went beyond the original year of 2003 in SI's story. Considering the circumstances, he probably did about as well as could be expected in a no-win situation. Strategically, A-Rod's worst mistake might have been one that is quintessentially A-Rod - he talked way too much. A-Rod could have gotten the same points across in far less than 35 minutes. The lengthy interview offered far more opportunities for vague statements that could be picked apart. A-Rod's best hope is that he stops being a 103-and-one player before too long. A-Rod deserves to face the consequences for what he's done, but so do 103 other players. Some video from A-Rod's upcoming interview with Peter Gammons has been released, and may be seen at espn.com. A-Rod: When I arrived in Texas in 2001, I felt an enormous amount of pressure. I felt I had the weight of the world on top of me and I needed to perform, and perform at a high level, every day. Presumably you had similar pressure when you joined the Yankees in 2004. What caused you to react differently than when you joined Texas? Gammons: You're saying that the time period was 2001, 2, 3? A-Rod: That's pretty accurate, yes. A-Rod deserves credit for admitting to more than was in the story that broke over the weekend, which only mentioned a failed test in 2003. But if you're really going to come clean, you've got to do better than, "that's pretty accurate." A-Rod: To be quite honest, I don't know exactly what substance I was guilty of using. Considering that A-Rod is making this confession after a published report said he tested positive for testosterone and Primobolan, why not at least admit to that? Keeping everything vague raises more questions than it answers. And, once again, we are asked to believe that a top athlete has no idea what he is putting into his body. I look forward to hearing the rest of the interview. In his 38 Pitches blog, Curt Schilling says he would be "all for the 104 positives being named, and the game moving on if that is at all possible." The pitcher/blogger writes "in my opinion, if you don't do that, then the other 600-700 players are going to be guilty by association, forever." Schilling is right, but in 2002, he was quoted as saying things that suggested he was well aware that the problem was much more widespread than 104 players. Schilling says that muscle-building drugs have transformed baseball into something of a freak show. "You sit there and look at some of these players and you know what's going on," he says. "Guys out there look like Mr. Potato Head, with a head and arms and six or seven body parts that just don't look right. They don't fit. It's no secret what's going on in baseball. At least half the guys are using steroids. Any such program would have to be collectively bargained with the Major League Baseball Players Association, which traditionally has resisted any form of drug testing but now faces a division in its membership over this issue (box, page 42). "Part of our task is to let a consensus emerge," says Gene Orza, the associate general counsel for the players union. It's been almost seven years since the SI steroids expose was published. It should be part of history by now. But it's as timely as ever because of baseball's continued refusal to fully address the issue. Sports Illustrated, like most media outlets, has chosen to make this primarily an A-Rod story, even going so far as to say that A-Rod was Barry Bonds' "most vociferous supporter" among players. SI.com doesn't even link to Verducci's 2002 article in their A-Rod coverage. The Post's Joel Sherman is one of the few who thinks that A-Rod can still "make himself a hero." A-Rod must become the first player to really explain the steroid era. We are not talking about naming names of others. We are talking about honestly talking about the culture in baseball at the time that motivated even the most talented player in the Milky Way to feel compelled to cheat. Sherman adds that A-Rod should agree to stringent testing and having blood and urine samples frozen for future independent testing for something that might be undetectable today. But one player can't crack the culture alone, especially one as widely disliked as A-Rod. Andy Pettitte had several longtime teammates alongside him when he admitted to HGH use. Who, if anyone, will stand next to A-Rod? Forget the players - I'd like to see Don Fehr, Gene Orza and Bud Selig up there with A-Rod, finally facing up to the problem. But I've got a better chance of seeing Manny Ramirez become a Met. Quick squawk this morning. Everybody and his brother has suggestions for what Alex Rodriguez can do or say to fix this steroids accusation. My answer? Nothing. There's nothing he can say or do to clean up this mess. He doesn't have the personality, or the media savvy, to turn fans on his side. Now that he has been tainted by steroids, his image will not quickly recover. The only thing that might help him is if the other 103 names are quickly revealed, and they include some other big names. That's about it. I don't need a court of law to tell me that he's guilty of using steroids. I just need his lack of response to the Sports Illustrated allegations to tell me that it's all true. What's up with Sports Illustrated and the Yankees? First, Tom Verducci worked on "The Yankee Years" with Joe Torre for two years without disclosing that conflict of interest in his column. And, as I squawked about previously, he criticized the Yankees repeatedly during that timeframe. Now, as I noted yesterday, Selena Roberts, co-author of SI's expose on Alex Rodriguez testing positive for steroids, also has a book coming out - this one about A-Rod, called "Hit and Run: The Many Lives of Alex Rodriguez." The book is due out in May. And like Verducci, she is not disclosing with her work in Sports Illustrated that she has that book deal. Unlike Verducci writing a book with Joe Torre while accusing the Yankee front office of having blood on their hands for Torre's departure from the team, I don't think Roberts has a conflict of interest here. But I do think she has an agenda. While I'm not questioning the veracity of her SI story, I am still wondering, like I wrote earlier, why she isn't going after the other 103 players with positive test results. And I'm also wondering why she can't be straightforward about the book deal. SI.com: One hundred four players tested positive for steroids in the survey testing of 2003. Alex Rodriguez is now the only known name among those 104 players, leading to some speculation that he was somehow "singled out." Can you explain why we know only of his inclusion on the list? Roberts: David Epstein and I were working on a profile of Alex -- he was a staple of the news this past year, whether because of Madonna or his broken marriage or the Yankees' dive in the '08 standings -- when we began hearing rumors about steroid use. You hear a lot of things in this business, so we went about our due diligence in nailing down the truth: Was this rumor or real? In a meticulous process, we verified and re-verified our information, because this is a human being here, so you absolutely do not want to be wrong. We made a decision to confront Alex with the evidence we had regarding his positive test, and give him a chance to explain. He chose not to. Here's the thing - she goes into contortions to show how fair SI was to Alex, but Roberts never answers the question about why she only investigated A-Rod, and not the other 103 names. I also can't understand why she doesn't just say that she heard rumors while working on a book - not merely a feature story - on A-Rod. So do you have hard evidence? Why haven't you mentioned what that is? 4 people telling you something is true isn't "hard evidence." Not in my book anyway. Hard evidence would be the list of the 104 players that tested positive. Do you have that? If so, where are the other 103 names? Do you have a failed drug test with Alex's name on it? What evidence do you have that hasn't been mentioned? Inquiring minds want to know. I'm just seeking the facts and you really haven't presented any. While I think Roberts' evidence is real on A-Rod - SI would be facing the mother of all lawsuits right now if she didn't have the goods on him, and Alex would have a heck of a lot more to say than telling her to talk to the union if he were innocent - I think she should be more straightforward on what evidence she has. Because if she indeed does have a list of the other 103 names, now would be a pretty good time to disclose them. And if she won't, A-Rod isn't the only one with some explaining to do. * You can't assume anybody in baseball is clean. Anybody. I thought Alex was steroid-free for several reasons, most notably because I figured that given what a lightning rod he is, somebody would have snitched on him before now. And while Jose Canseco turned out to be right, his shifty story about "Max" the dealer, and the fact that Canseco didn't put the A-Rod stuff in his first book, made him look less than credible. It also seemed that if Alex were dirty, it would have come out then - or during his divorce battle. So much for that thinking. * The Yankees are stuck with an albatross of a contract - 9 more years, $240-$270 million more dollars - which was based on a phony premise - that A-Rod was going to be the player who cleanly broke Bonds' all-time home run record. That's the only reason that ridiculous money made sense, given that no other team came close to going after A-Rod this time around. So much for that. Then again, I can't really feel sorry for the Yankees on this. Remember, last winter Hank Steinbrenner claimed that A-Rod would have to give them a discount since the Bombers lost the Texas Rangers' $25+ million subsidy when he opted out? It never happened. And not only that, but given the Jason Giambi saga, the Yanks should have at least tried to put something in A-Rod's contract about performance-enhancing drugs, but apparently they didn't. * What about the 103 other players who tested positive for steroids in 2003? Do Sports Illustrated writers Selena Roberts and David Epstein know their names? And if they do, why aren't they writing about them? In his 38 Pitches blog, Curt Schilling says he would be "all for the 104 positives being named, and the game moving on if that is at all possible." The pitcher/blogger writes "in my opinion, if you don’t do that, then the other 600-700 players are going to be guilty by association, forever." That is true, but it is also true that the other players can't be proven clean just by not being one of those 104 players with positive 2003 test results. Remember, every single one of these knew that they were going to be tested that spring, and they had time to prepare their bodies to test clean. Yet over 100 of them still failed. * Which brings me to my next point: The only big star who failed a steroids test since the testing program went into effect was Rafael Palmeiro, not long after his sanctimonous Congressional testimony saying he never used steroids. And, as I wrote yesterday, A-Rod, among other players, were reportedly tipped off by Gene Orza of the players' union in the fall of 2004 about an upcoming test. So, you have to wonder if the reason that there haven't been bigger names failing these tests is because MLB is protecting its superstars. And even if they aren't being tipped off, is it possible that the biggest players are able to afford better performance-enhancing drugs that don't show up in drug tests? Or that they're using human growth hormone, which is undetectable? * The era of players bragging about their workout regimen has to be over. Think about it. Who told us over and over about how hard they worked at keeping their bodies in shape? They were people like Barry Bonds, Roger Clemens and his good buddy Andy Pettitte, and Alex Rodriguez. Come to think of it, in the music world, A-Rod's "soulmate," Madonna, is said to work out an incredible four hours a day. Just look at those arms! Hmmm. I guess we'll never hear another player brag about working out while other players are taking their kids to school! A quick note before we go all A-Rod, all the time. If you don't already read Steve Lombardi's blog Was Watching, you really should. He not only writes a great blog, but he's a really good guy. Anyhow, he asked fellow Yankee bloggers their thoughts on the last five years in Yankeeland. Click here to read what other Bombers fans on the Internet, including yours truly, are squawking about. What is in Derek Jeter's future with the Yankees? How much of a gamble is the Oliver Perez signing? Are the Yankees working on a dream for 2009?